If the factor is more than 1335, add more rear gear. Hydraulic roller lifter priming notice: Ensure each valve lifter is filled with clean engine oil and the valve lifter does not tip over (plunger down) before the installation of the valve lifters. The loss of oil in the valve lifter lower pressure chamber or the dry stroking/cycling of the valve lifter plunger will allow air to travel into the high pressure chamber of the valve lifter. Air in the high pressure chamber of the valve lifter may not be purged causing extensive engine component damage. 1. Remove the valve covers, and pick a cylinder you are going to set the pre-load on. Only do one cylinder at a time. 2. Rotate the engine in its normal direction of rotation (clockwise) and watch the exhaust valve on that particular cylinder. When the exhaust valve begins to open, stop and adjust that cylinder's intake rocker arm. 3. To adjust, back off the intake rocker arm adjusting nut and remove any tension from the push rod. Wait a minute or two for that hydraulic lifter to return to a neutral position. The spring inside the lifter will move the push rod seat up against the retaining lock, if you give it time to do so. 4. Twist the intake push rod with your fingers while tightening down the rocker arm. When you feel a slight resistance to the turning of the push rod, you are at "Zero Lash". Turn the adjusting nut down one half to three-quarters of a turn from that point for street applications. Use 1/8 to 1/4 turn for race applications. Lock the adjuster into position. The intake is now adjusted properly. 5. Continue to turn the engine, watching that same intake valve/rocker you just set. It will go to full open and then begin to close. When it is almost closed, stop and adjust the exhaust rocker arm on that particular cylinder. Loosen the exhaust rocker arm and follow the same procedure described before in steps 3 and 4 to adjust this rocker arm. 6. Both valves on this cylinder are now adjusted, and you can move on to your next cylinder and follow the same procedure again. There may be some initial valvetrain noise when the engine is first fired up but once oil pressure has stabilized and the engine heats up, it should quiet right down to a normal level. Remember that some racier camshafts will have a mechanical sound to them and will not be a silent as factory units. Crane has always taken pride in trying to produce only top-quality camshafts and valve-train components. One problem that occurs however, is that we never know exactly how the products are going to be used. When you think of the number of mathematical permutations about all of the combinations of cam profiles, valve springs, cylinder heads, push rod lengths, intake and exhaust systems; you immediately realize that no manufacturer could ever test for everything. It is even impossible to test for 5% of the total possibilities. So we do the best we can! Much of our product development time on roller lifters, rocker arms and valve springs is spent on durability testing with different combinations of related components. One inescapable fact has emerged from several years of testing: it is impossible to have a push rod that is too stiff! Push rod flex is a major cause of roller lifter failure, early valve spring load loss and excessive valve seat wear. Consider the push rod as if it were a pole-vaulters pole. When the lifter first starts to open the valve (especially at higher engine speeds against stiff valve springs and/or high residual cylinder pressure), the push rod bends and then snaps back. The “snap-back” can send the rocker/valve spring assembly on an uncontrolled journey that causes “valve-train separation” (lash between lifter and push rod, push rod and rocker and rocker and valve). When this separation is finally eliminated by the valve spring, the lifter can slam violently against the cam lobe and the valve can slam violently against its seat. If this action persists, lifter axle and wheel failure can result. Additionally, excessive valve seat wear and valve damage can occur, as well as accelerated valve spring load loss; not to mention camshaft lobe failure! “Valve-float” that is automatically attributed to the valve spring design is frequently the cause of excessive “springiness” in the push rod. This is especially true on long push rod applications. For instance, lifter failure and valve seat erosion on the exhaust (but not the intake) of a Big Block Chevrolet might be attributed to bad components or the wrong valve spring; however the longer exhaust push rod just might be the real culprit. Almost every time that we have increased the stiffness of the push rod, benefits have been observed. This has been true even when the push rod increased in weight. This happens because the lever advantage of the spring working through the rocker ratio means that weight on the push rod side of the rocker fulcrum is not nearly as critical as weight on the valve side. The only occasion where we saw a power loss was when the push rods that we were using gave us “symmetrical lofting” of the valve. This “controlled” lofting actually added area under the lift curve. When we replaced the push rods with stiffer designs, the “controlled loft” (and extra area under the curve) was lost and power decreased. Be advised, this is a rare occurrence and “controlled, symmetrical lofting” usually only occurs in a relatively narrow RPM range. Without availability of a Spintron, dyno, and other diagnostic equipment, it would be very dangerous to count on “controlled lofting” when engineering a valvetrain! The point of this presentation is that if you are having valve train issues: reliability, RPM capability, power output, broken parts, etc., look at the stiffness of the push rod that you are using. By their very design, straight push rods have their own “critical frequencies” that can aggravate other frequency issues in the valve train. When possible, we recommend the use of “double-taper” push rods. The “double-taper” design almost necessitates the use of shaft-mounted rockers, but they really minimize push rod problems. Push rods seem very straightforward and uncomplicated, but don’t let their appearance fool you. They are among the most notorious gremlins that live in our engines and drive us nuts!!! This is one of the most popular comments I hear after less than ideal results are seen when a camshaft installation is completed. Just the mentioning of this sends chills down my spine. The proper installation of a camshaft and its peripheral valvetrain is one of the most important jobs an installer must do when maximizing the performance of any engine combination. Any short cuts or miscues in this regard, and the overall success of the project, and its ultimate performance, will definitely suffer. How can something so simple be so problematic? Let’s start with the basic premise that everyone can have a bad day at work. Who’s to say the crankshaft keyway was machined absolutely “dead on” when the machinist set it up? I mean, even a slight error of a degree or two is no big deal considering the thousands and thousands of engines out in the world. They run, don't they? Maybe it wasn’t even a bad day but something that is machined off the mean number but still within manufacturing tolerances. What's a degree or two among friends? Now we have the next piece of the tolerance puzzle, the timing set. There are a series of variables that can occur with this component. The relationship of the keyway to the crankshaft sprocket teeth, the location of the cam dowel hole to the cam sprocket teeth and then there’s always the possibility of “both” items being off. Why worry? Well, if each facet is off in the same direction, it is a cumulative error that will change the engine's dynamics. 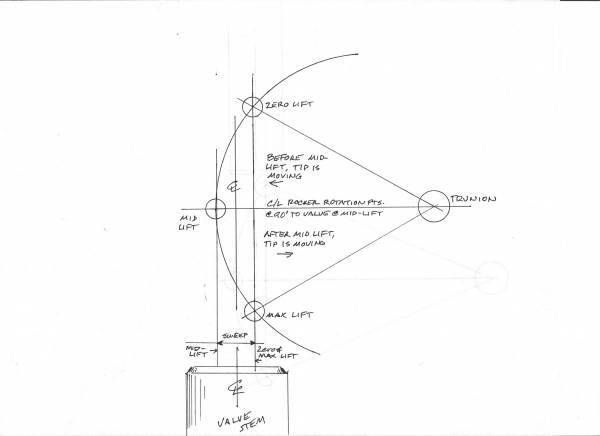 That's why verifying the intake centerline as it relates to top dead center is very important. When you're installing these two pieces to the engine, who’s to say they are so perfect, there’s no reason to check them? Nothing is further from the truth. You'll never hear a professional engine builder say this. At least not one that knows the hows and whys of valvetrain importance. This is the type of attention to detail that separates the engine assemblers from the engine builders. No camshaft should be just installed “dot to dot” if the installer is a professional! Now the novice or the weekend mechanic might be able to justify doing a camshaft installation in this manner just because the tools required are not something a newbie has put the investment in. It's "almost" forgivable when this is spoken. However, when I hear his “dot to dot” comment from a shop that just charged a customer a lot of money to do the install, well, it definitely crosses the line and takes them off the referral list. Take your time and verify everything. If you don't have the time, tools or talent to do it yourself, find a professional to do it for you. It's worth the effort! Next chapter... lifter preload... Coming soon! Are your sprockets lined up? The basic engine building procedure than seems to be overlooked nowadays is making sure that the upper and lower timing chain sprockets are in line with each other. With incorrect alignment, the stresses created can easily lead to premature timing chain failure (and we all know the mess that creates), and if the misalignment is pulling the cam forward, the lifters can contact the adjacent cam lobes and journals, creating an engine full of debris and again, failure. With a proliferation of aftermarket blocks and crankshafts, along with many different choices of timing sets (each having numerous thrust bearings and shim options), it’s difficult to assume that all will be fine. Even standard blocks may have had their cam thrust faces machined for one reason or another, and if that info is not passed on, there's another opportunity for disaster. To confirm proper alignment, install the crank sprocket (apply mild heat via submersing in hot water if necessary to ease installation), making certain that it is up against the register on the crank. Then install the upper sprocket onto the camshaft, including any thrust bearings, thrust shims, retaining plates, etc. Then install the camshaft (without timing chain) into the engine, torquing all fasteners as required. You may also want to install the front balancer at this time, to insure that the crank sprocket is being properly positioned. Place a straightedge against the front edge of the sprockets and inspect to confirm that straightedge contact is continuous on the sprockets. If the cam sprocket is too far back, a thrust shim may be able to be added behind it to obtain proper alignment (you'll need to make sure that the lifters and lobes are still properly aligned if you use this option). If this is not possible, a step on the rear of the crank sprocket may have to be machined to allow it to slide further back on the crankshaft. If the cam sprocket is too far forward, the thrust surface on the rear of the cam sprocket may be machined (again check lifter to lobe alignment), the thrust face of the block may have to be machined (yes, engine disassembly time again), or a shim placed behind the crank sprocket to achieve alignment. These are numerous possibilities to correct misalignment, depending on the engine type and optional timing components that may be available. The main thing is to check this as early as possible in the engine building process, allowing you the time to exercise different choices to correct any difficulties. Also, check to be certain you have sufficient clearance between the chain and the block casting, and the chain to the timing cover. With many of today's wider chains, space may be at a premium. Checking these factors will help allow your engine to have a good, long life. This is cheap insurance to protect your investment. How to avoid wearing out the teeth! Excessive distributor gear wear can be a problem with Ford engines. Most of the time, the problem is a result from the use of a high volume oil pump. High volume oil pumps put a lot of stress on the distributor and cam gears. A high volume oil pump is not necessary on a street driven engine that turns no more than 7000 rpm. Only extreme racing engines require the high volume pump. 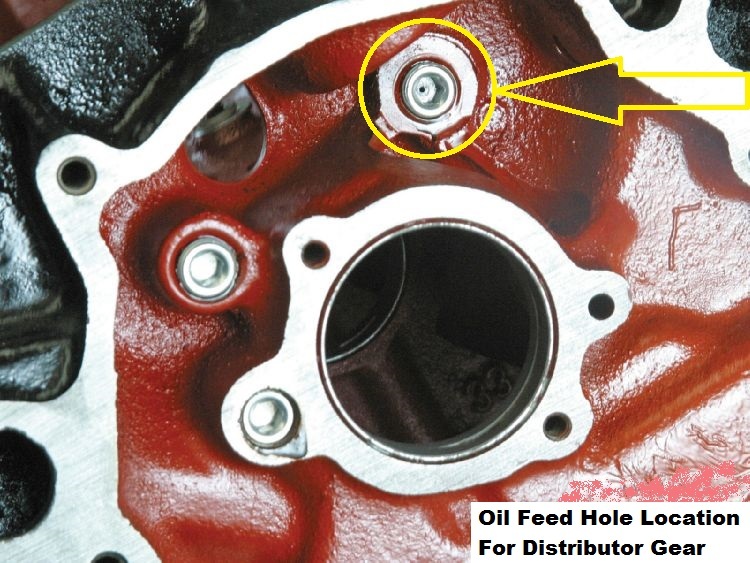 Should you use this type of oil pump, the following precautions will save your distributor gear from early destruction. (1) Drill a .030" hole in the lifter/oil galley plug behind the distributor. This will allow additional lubrication on the distributor and cam gears. This will not lower oil pressure enough to hurt the engine. (2) Ford oil pump mounting brackets have elongated holes. Due to this, the distributor shaft and oil pump shaft should be aligned so that the distributor turns freely before tightening the mounting bracket bolts. Failure to do this will cause a binding situation, thus damaging the gear. (3) Stock Ford hex oil pump drive shafts are know to vary in length which could cause a bottoming or binding situation. (4) Brass distributor gears can be used to avoid damaging the cam gear. Brass gears are softer and can wear out quicker than the cast gear, but will not cause damage to the cam gear. If using a brass gear, check it occasionally for wear. (5) Use a zinc additive oil. Royal Purple, Brad Penn and Rotella have zinc in their additive package. This helps avoid wear on all engine parts. Use it. 1) Remove the existing valve spring/retainer/lock assembly from the heads. This will require either a “C clamp” style of spring remover (if heads are off the engine) or an “on the head” style of spring remover with a compressed air supply in the cylinder if the heads are still installed. Any good parts store or machine shop can rent these types of tools. 2) Remove the existing rubber or acrylic valve seal assembly from the heads. This may require the use of a flat blade screwdriver or pliers to pry off the guide and valve. 3) Remove the existing spring locators from the valve spring pockets. (if so equipped) Some cylinder heads use regular shims or stamped locators instead of hardened locators. 4) Remove any shims that came with the heads and set aside. (if so equipped) This spring kit may or may not require the existing shims be reused to obtain the proper installed height. 5) Install the black, hardened and machined spring locator into each spring pocket. The kit contains 16 hardened and machined spring locators, one for each valve guide. 6) Check and verify proper installed height with kit’s spring retainers and valve locks The best method is to use a Hite-Micrometer but a machinist scale or gauge trimmed to fit will work. 7) Install the new “viton” valve seal from the kit. Once installed height is set, use a deep socket or specialty seal installation tool and a small hammer. Be sure not to tear the seal with the valve lock groove. A small thin plastic sleeve placed over the valve stem is best to avoid the ripping or tearing. 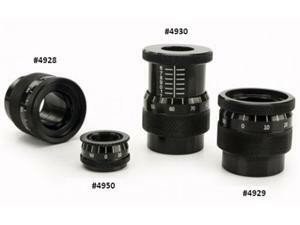 Some valve guides have varying diameters and seal installation may be snug. 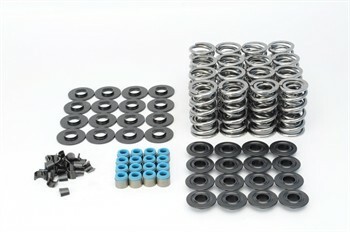 8) Install the springs, retainers and locks contained in the new LSX Dual Valve Spring Kit. Use some white lithium or Vaseline to hold the valve locks during installation. A small pen magnet is also a good idea to avoid a loss of the locks. The proper installed height for the GEN3-LSX spring kit is 1.800” to obtain 155#-160# on the seat and 425# at .675” lift. This is a complete “drop-in” for most aftermarket cylinder heads with larger dual or single springs. This kit should allow the package to obtain these dimensions as aftermarket heads generally use a 1.800”-1.815” installed height with their stock packages. Verification is highly recommended! The proper installed height for the GEN4-LSX spring kit is 1.800” to obtain 140#-145# on the seat and 390# at .500” lift. This kit should allow the package to obtain these dimensions as aftermarket heads generally use a 1.800”-1.815” installed height with .030” of valve spring shim added. Verification is highly recommended! The proper installed height for the GEN5/PAC Racing 1221 LSX dual spring kit is 1.800” to obtain 135#-140# on the seat and 400# at .650” lift. This kit should allow the package to obtain these dimensions as aftermarket heads generally uses a 1.800”-1.815” installed height with .060” of valve spring shim added. Verification is highly recommended! The proper installed height for the GEN4L/Lunati LSX dual spring kit is 1.810” to obtain 150#-155# on the seat and 400# at .660” lift. This kit should allow the package to obtain these heights as aftermarket heads generally uses a 1.800”-1.815” installed height with .060” of valve spring shim added. Verification is highly recommended! The proper installed height for the GEN5XL/ PAC Racing 1521 LSX dual spring kit is 1.800” to obtain 155#-160# on the seat and 450# at .650” lift. This kit should allow the package to obtain these dimensions as aftermarket heads generally uses a 1.800”-1.815” installed height with .060” of valve spring shim added. Verification is highly recommended! The proper installed height for the GEN6A-LSX spring kit is 1.800” to obtain 155#-160# on the seat and 436# at .650” lift. Coil bind is at 1.000”. This is a complete “drop-in” for most aftermarket cylinder heads with larger dual or single springs. This kit should allow the package to obtain these dimensions as aftermarket heads generally use a 1.800”-1.805” installed height with their stock packages. Verification is highly recommended! The proper installed height for the GEN6B-LSX spring kit is 1.800” to obtain 160# on the seat and 482# at .700” lift. Coil bind is at 1.000”. This is a complete “drop-in” for most aftermarket cylinder heads with larger dual or single springs. This kit should allow the package to obtain these dimensions as aftermarket heads generally use a 1.800”-1.805” installed height with their stock packages. Verification is highly recommended! The proper installed height for the GEN6C-LSX spring kit is 1.800” to obtain 160# on the seat and 510# at .700” lift. Coil bind is at 1.000”. This is a complete “drop-in” for most aftermarket cylinder heads with larger dual or single springs. This kit should allow the package to obtain these dimensions as aftermarket heads generally use a 1.800”-1.805” installed height with their stock packages. Verification is highly recommended! 1. Do not wash in any solvent. Wipe the parts off with a lint free towel. 2. Use 10W-30 oil and lube the outside diameter of the body and wheel. 3. Make sure the lifter-to-bore clearance on cast iron blocks is: .0015” - .0017”. On aluminum blocks that oil the lifter (LS Series), the clearance is: .0012” - .0014”. Both of these measurements are at 70 Deg F. The aluminum block will have a higher rate of expansion and that is why the clearance is tighter. 1. I always like using the firing order to set the valves. Put the engine on #1 cylinder. 2. What we want is the intake & exhaust to be on the base circle of the camshaft. 3. Adjust the rocker until the push rod just starts to get tight while taking the push rod and rolling it between your thumb and finger. Once you feel drag, this is what we call "zero-lash". a. It is important to know the thread pitch, in threads per inch, of the adjuster nut, because one complete turn of the nut will move a distance of one complete thread. Therefore, verify the thread pitch of the adjuster nut, because racing rocker manufacturers use different nut sizes and thread pitches. b. If your adjuster nut is 7/16 x 20 threads per inch, then divide 1 inch by 20 threads per inch. One complete turn down on a 7/16 by 20 adjuster nut will move .050". c. Next, divide .050" divide by 4 to calculate the distance for a quarter-turn of the adjuster nut (.050" / 4 = .0125"). d. For a 3/8 x 24 adjuster nut, the calculations are: 1" / 24 TPI = .042" per full turn and .042" / 4 = .0105" per quarter-turn. Cast Iron block and Cast Iron Head = .020" - .025"
Cast Iron block and Aluminum Head = .030" - .035"
Aluminum block and Aluminum Head = .045" - .050"
5. Repeat these adjustments for each cylinder running through the firing order.